What is ease and how much do you need? Ease is the difference between the finished measurements of the garment and the actual measurements of the body inside that garment. Forster from Norah Gaughan vol. 13 is an example of a sweater worn with very little ease. 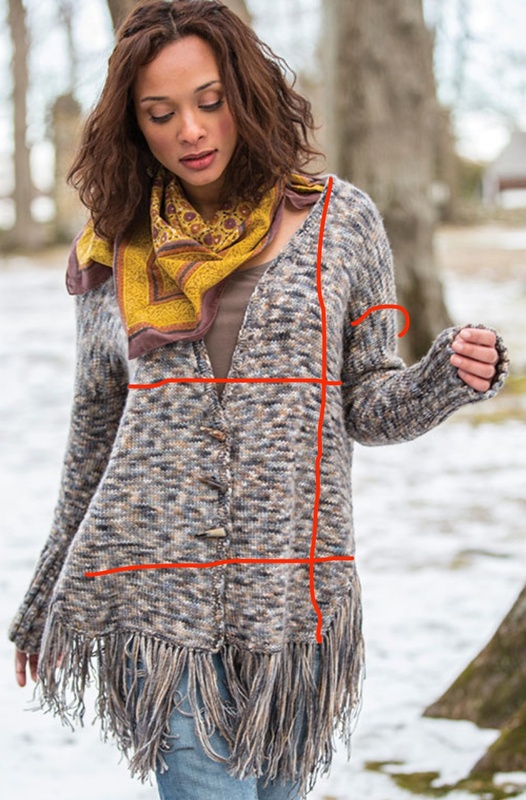 The pattern is written to fit 30(34-38-42-46-50-54)” but the actual finished measurements of the sweater are 32(36-40-44-48-52-56)” or 2″ of ease. Clearwater from booklet #352 Nomad is worn with a lot of positive ease. The pattern is written to fit bust sizes: 30(34-38-42-46-50)”, while the actual size of the finished sweater is 40(44-48-52-56-60)” or 10″ of ease. Now to me, 10″ is an awful lot of ease, but for you that might be absolutely perfect. There is never a “correct” amount of ease for everyone for any garment. The best way to identify how much ease you should have for a sweater is to look at what you already have in your closet- If the garment you want to make is loose fitting like a cozy, comfy sweatshirt, measure your favorite sweatshirt. If the look you’re going for is more fitted and formal, measure something fitted or whatever shirt you’re likely to wear under your sweater (and then add about a 1/2 inch to make it more layering friendly). Measure the ready-to-wear across the chest at the underarm, at the hip or hem and across the upper sleeve/bicep. Then check the length by measuring the shoulder to the underarm, the underarm to the hem and the sleeves, too. Compare these measurements to your schematic and choose the size that most closely matches the measurements you know work for you.